Collagen to help remove fine lines and wrinkles, while preventing them from forming. Collagen is also essential for strong, healthy bones and joints. Starting at age 21, collagen diminishes 1% per year. By age 30, the signs become very visible. 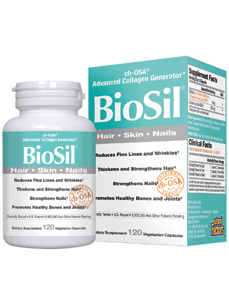 BioSil's landmark discovery of ch-OSA gives your skin the capacity to generate collagen with your own DNA fingerprint. This makes ch-OSA the genuine breakthrough in collagen. Keratin the protein that's found in your hair shaft. It gives your hair thickness, body, strength, and elasticity. Plus, keratin gives your nails strength preventing them from breaking & becoming brittle . Since all three of these proteins decline with age, it is essential to replenish them with supplementation.
. DIRECTIONS: Take one capsule, two times per day.